Creating a game and putting up on Kickstarter can be a nerve-wracking affair. You need to have the game playtested, art for the game, and an audience to bring in some hype. Usually a group of people work together on different parts of the game to complete it. Few are brave enough to go it alone, but Jamie Noble Frier decided to go strike out on his own and see how he’d do with Hero Master. It’s up now on Kickstarter, and I got the opportunity to ask him eight questions about his project. I love games. Both tabletop and video games. I have worked in both for the past ten years as an artist. Over that time I’ve played more, loved the hobby more, and as a creative kind of person started to come up with my own ideas and themes. Hero Master has been floating around my head for a long time now in one shape or another so it’s great to finally see it materialise! I have to give a special thanks to the guys I worked with at Red Bedlam (an indie games company in Brighton UK). Ben Hooley (the lead artist there at the time) helped me progress as an artist and also introduced me to a lot more board games than I realised were out there. I still need to get back to regularly gaming with him and a few of the other guys from there (we’ve all gone our separate ways work wise). Throughout my career I’ve been lucky with the people I’ve met, I worked with a really cool game designer called Mat Baker, who works for various video game companies. He was really helpful in understanding some of the fundamentals of game design, and showed me there was a method and deep principles to game design, not just a load of playing around! Later I managed to meet a few industry guys in Facebook groups and forums, like Gonzalo from Thundergryph and they helped me and still do help me get my head around both design processes and business practices in the industry. What made you decide to handle everything in the design of Hero Master? I’ve worked on games for other folks for a while now. I love working with people and bringing their ideas to life, but to have my own complete freedom was exhilarating and actually really addictive. I remember working with friends on making indie video games together as side projects. I used to get stuck a lot and have to find people to help with elements I couldn’t do. With board games, I realised as an artist, I could bring my own ideas to life with the skills I had. I have had to learn a lot of new things though, particularly on the business and marketing side. All the fun bit of designing is great, play testing, tweaking, art and writing. Then comes all the freight quotes and manufacture numbers. I’ve also retaught myself animation for use on the Kickstarter campaign! What has been the biggest advantage of handling everything yourself? Financially it’s been less of a risk, as I’ve not had to shell out for art, which is such an integral part of getting the game noticed (people do judge a book by it’s cover unfortunately). However, as art is my full time job, it’s basically the same as paying for it as I’m using my own man hours for this project. However, it just means I can do loads of “overtime” to get it done. Juggling clients, Hero Master and life has been no easy feat, though it has been incredibly rewarding. I think the main thing is the sense of achievement that comes with doing it all yourself. I keep looking at the prototypes, the Kickstarter page, the reviews that come back and think, “wow, I did this stuff!” and it makes me feel really proud. What has been the biggest disadvantage of handling everything yourself? There are a couple. There’s the work load is an easy one to say, but I think the main one would be the emotional side of things. There will be times when I get a knock, and need some reassurance to make a positive change and get back on track, and there are times when I want to jump for joy look for a high five and I’m left hanging. Fortunately my family and friends have been incredibly supportive. I’ve also met a really good bunch of folks in the industry who are really keen to see me succeed, they have become friends over the past few months, it’s been lovely. Why focus on a party that hasn’t had the best success in dungeon delving? I love the cliché dungeon crawler, with toughest of the tough warriors leveling up to extraordinary demi-god levels of power. I will definitely one day look at making my own! …However I wanted to do something a little different, something that had a bit of humour in it. You can imagine those guys who left the hamlet with a cheap sword and a half eaten sandwich. Hoping to win fame and fortune… Only to find that they probably should have stayed at home and mucked out the horses like they were asked to. I really love that kind of doomed hero humour. They always end up being my favourite characters in things, right now Sand dan Glokta from Joe Abercrombie’s (excellent) series of books The First Law springs to mind. They often have more depth, and that made writing the backstory based humour really easy on the cards. I felt like I was getting to know the characters as I wrote. It also allowed me to play with different mechanics and look at dungeon crawl/RPG tropes upside down. What if critical fails just were a daily occurrence for the party? What if these guys were so awful and self centered, that a co-operative party would never work? It gave me loads of options for gameplay quirks. Why would you want to cause issues with the other members of the party? You guys can’t stand each other. In your minds you’re above the likes of your idiotic fellowship. So this is one last (reluctant) shot at a big haul to prove yourself, then you’re out of here, to join one of the parties that consistently turns you down for being so useless. So if anyone is going to get in the way, or try and declare themselves Party Leader and tell you what to do, you’re sure going to get in their way. Half the time your characters don’t even realise they’re doing it. Thematically a lot of the bungles are just the characters’ innate foolish traits that drive the rest of the party insane. So the Barbarian with his lack of spatial awareness will get in your way, and the Elf will constantly remind you that he is of a higher stock than you. How does the game end and the winner get determined? You’re all searching for the jackpot, the Dragon’s Den. If you can bag a good portion of gold from that you’ll get some respect for sure! … Right? The party travels through a small deck of cards, moving from location to location earning gold to buy some respect (and drinks) at the tavern. The player with the most gold at the end of the game is the winner. The game ends when the players finally reach and play through the Dragon’s Den; where they will more than likely be munched by Crackletooth the Tepid, “Scourge of the mountain, guardian of gold… the burner of toast”. What made you create a character generator for Hero Master? One of my favourite parts of playing RPGs was rolling up a new character. I don’t think I’m alone in saying I had a folder full of unused, pre-rolled characters, each with backstories. So I’d asked a friend who has some serious app design talent if a character generator was possible to help garner some interest for the humour in the game. I’m so pleased with it, it’s a real blast (thanks Tim Simms). Today I made “Martin the Concussed”, once the greatest student in the art of war, who slipped on the bathtub, hit his head and forgot everything. He was last seen milling around the city gates getting confused about which end of his sword to hand to the city guards. Hopefully, it will give potentially interested backers an interactive way to taste a bit of the Hero Master humour, and peak their interest in taking a deeper look at the game. I do have to give Jamie props for this, and his Kickstarter is already successfully funded. 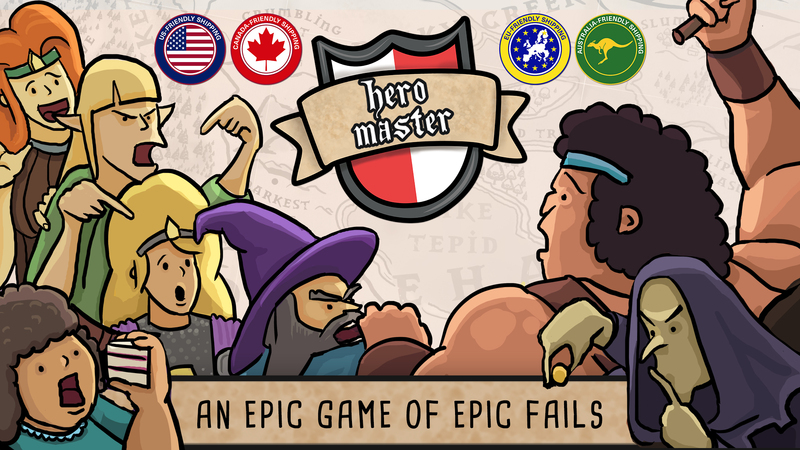 If you like the humor and the idea of backstabbing your dungeon party, then check out Hero Master.